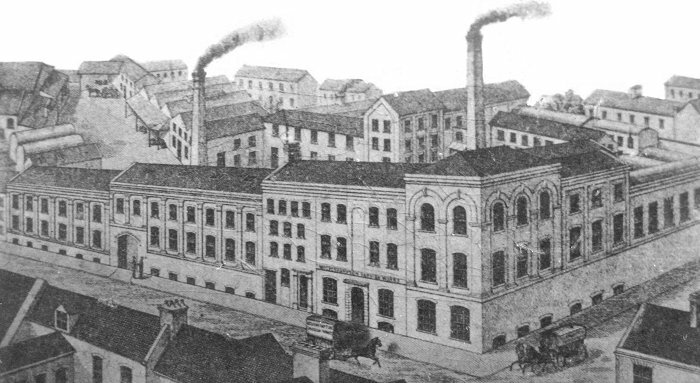 On the left is a view of the factory in 1859. 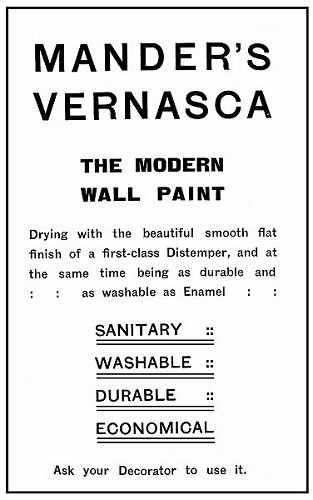 On the right is an advert from the 1920s. 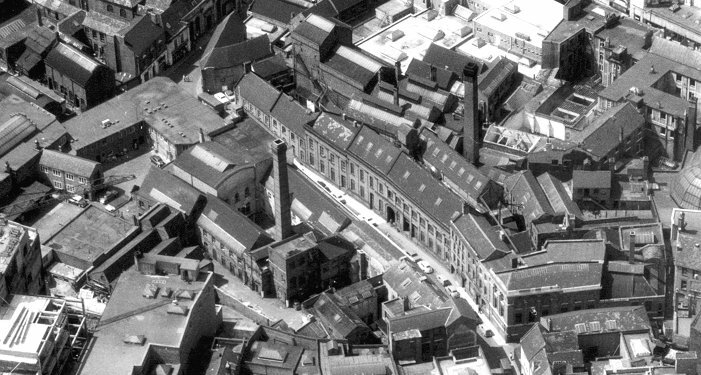 An aerial view of the factory in St. John's Street. 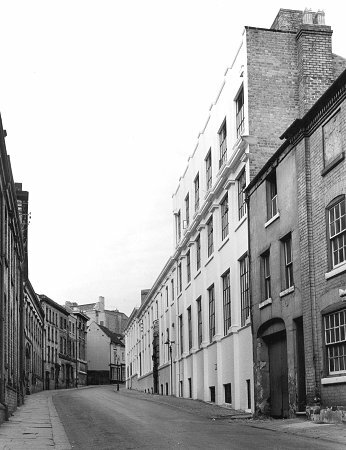 Two photographs of St. John's Street and the factory. 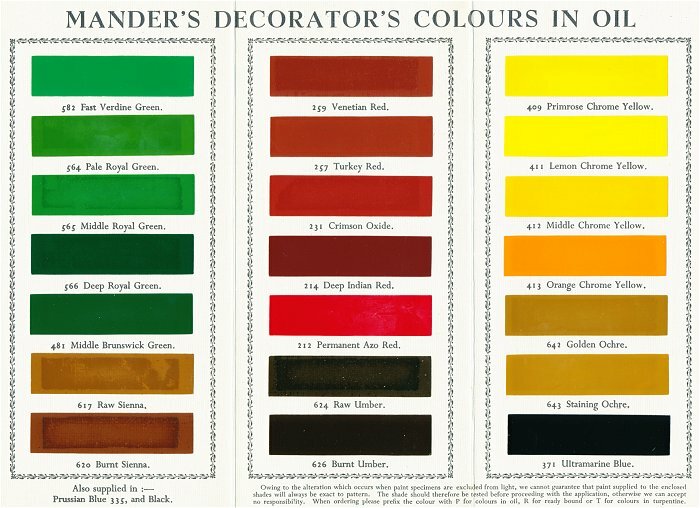 The one on the left, from around the time of the First World War, is from the staff magazine, 'The Green Can'. The other is from around 1960. 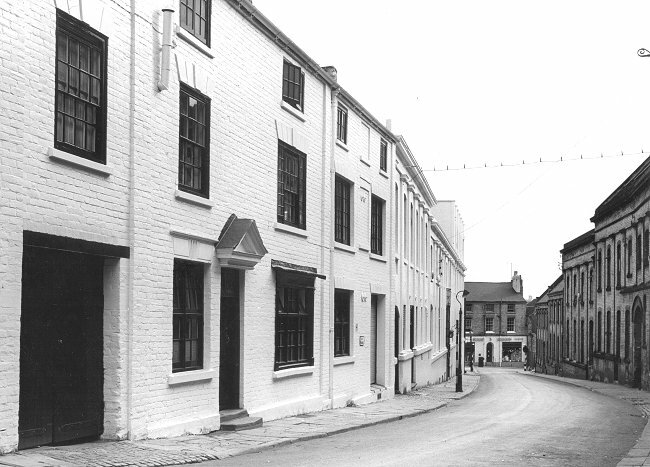 Another view of St. John's Street, this time looking in the opposite direction. 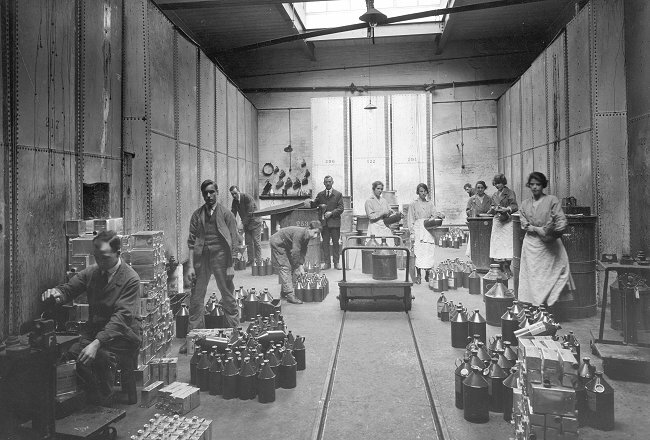 The Varnish Department at St. John's Street Works. 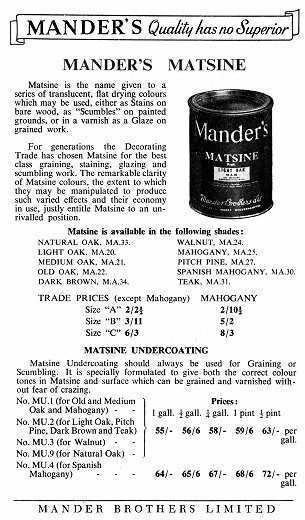 From the staff magazine, 'The Green Can'. 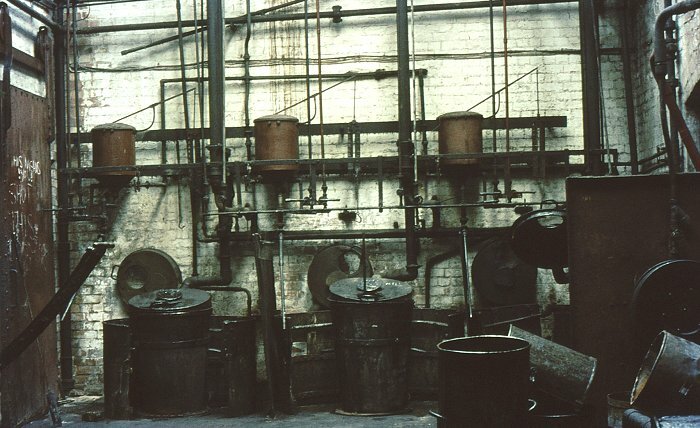 The company's gas works on the St. John's Street site. From 'The Green Can'. 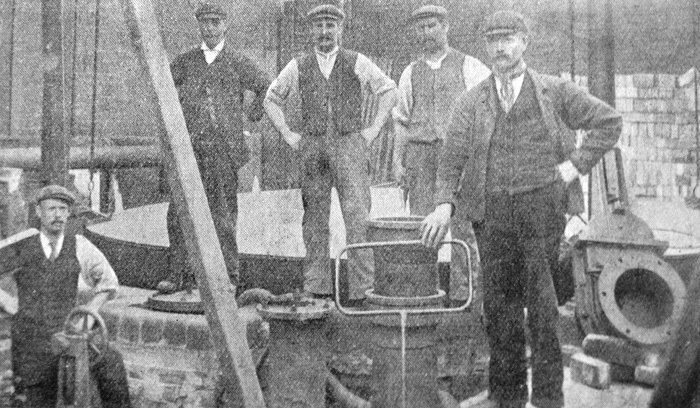 The staff at the gas works. 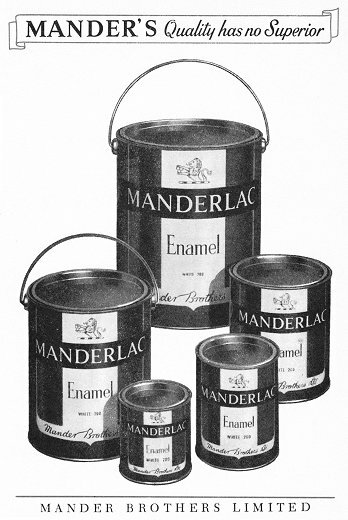 From 'The Green Can'. 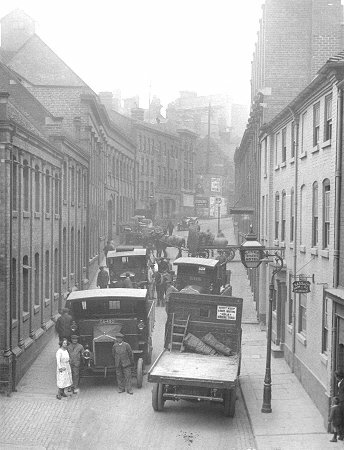 An old drawing of St. John's Street Works, date unknown. 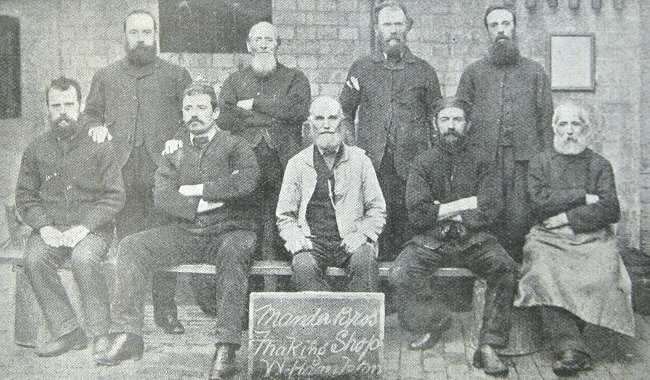 The staff in the varnish making shop in 1888. 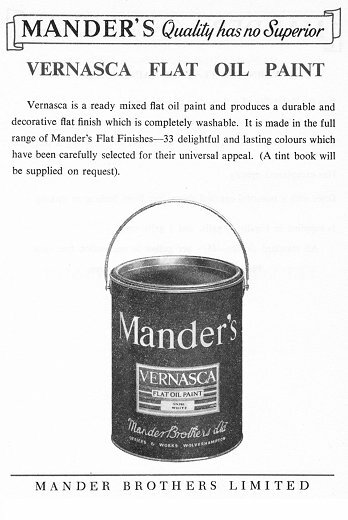 From 'The Green Can'. 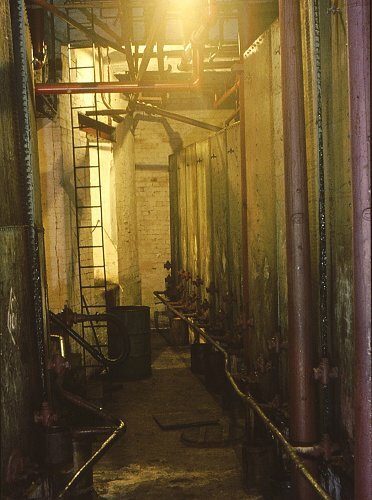 The cellar tanks at St. John's Street Works. Courtesy of David Clare. 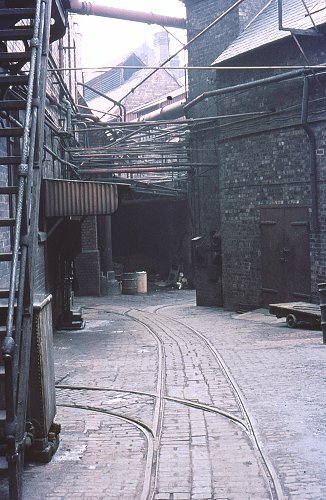 The yard at St. John's Street Works. Courtesy of David Clare. 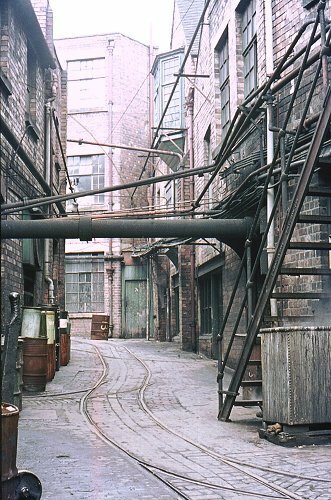 Another view of the yard at St. John's Street Works. Courtesy of David Clare. The open hearth shop at St. John's Street Works. Courtesy of David Clare. The thinning shop at St. John's Street Works. Courtesy of David Clare. 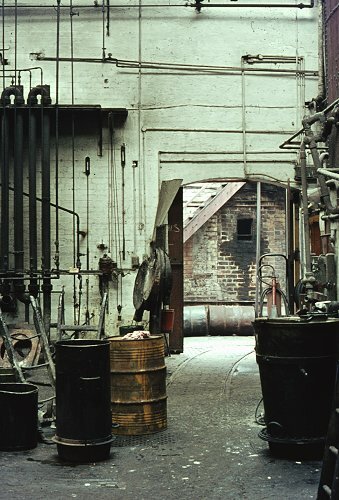 The yard outside the thinning shop at St. John's Street Works. Courtesy of David Clare. Weighing the ingredients at St. John's Street Works. Courtesy of David Clare. 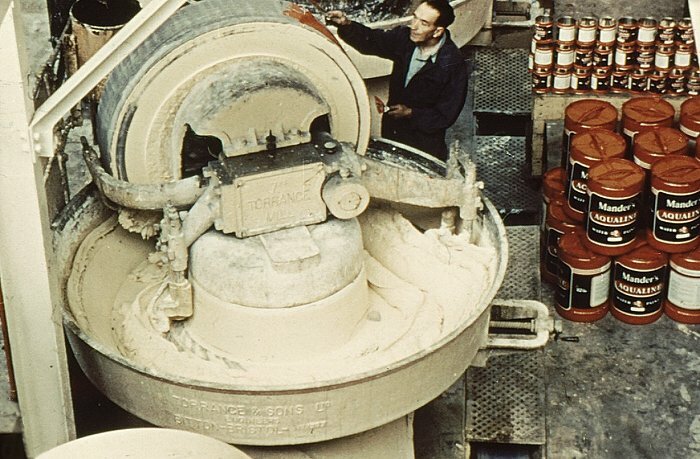 A Torrance patent grinding mill, made by Torrance & Sons Limited of Bitton, Bristol. 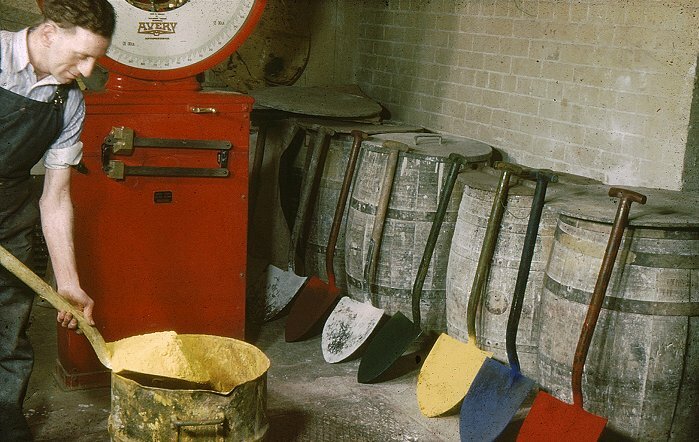 It used a grindstone to grind the ingredients used to make emulsion paint. Courtesy of David Clare. 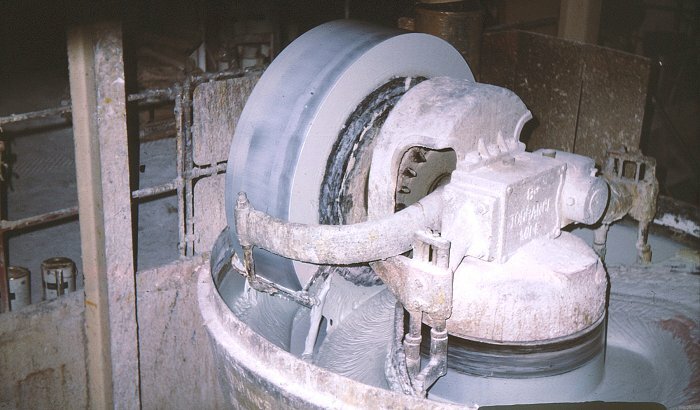 Another Torrance grinding mill. Courtesy of David Clare. 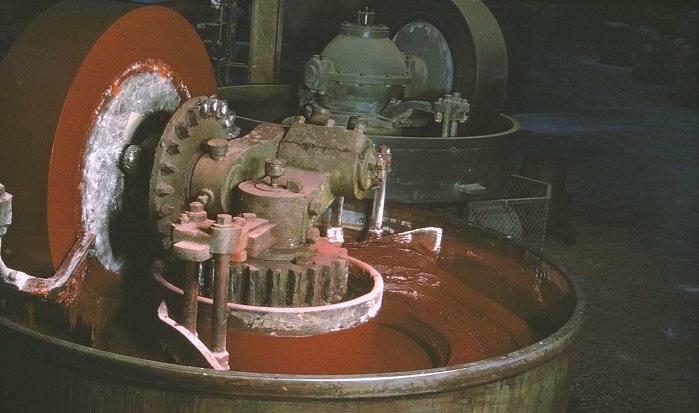 Another grinding mill, used for red emulsion. Courtesy of David Clare. 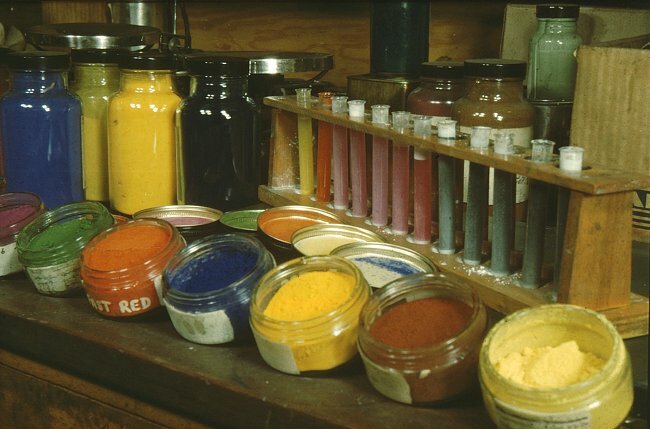 A corner of the laboratory. Courtesy of David Clare. 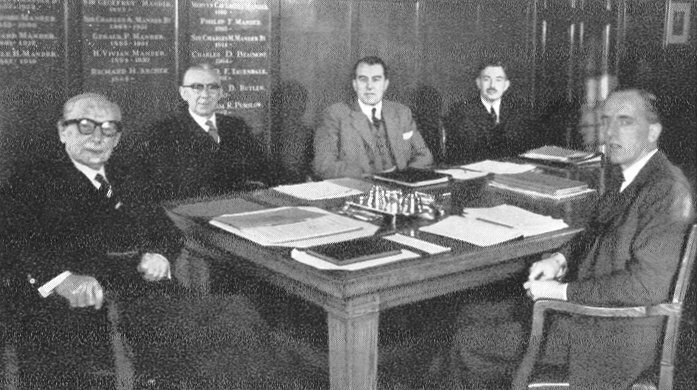 The Board in 1954. From the company's rule book. 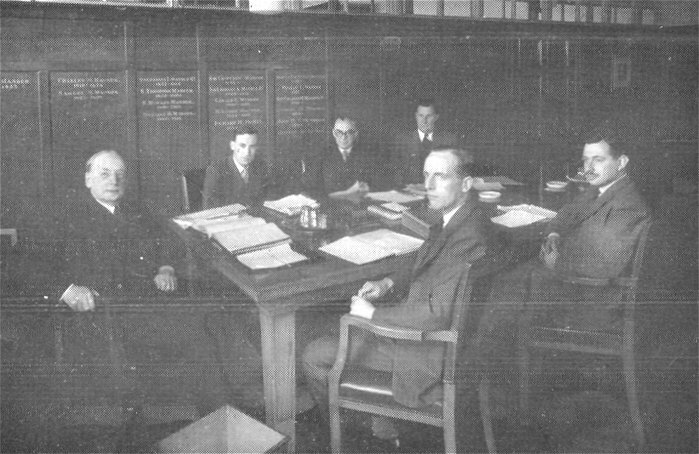 The Board in 1959. From the company's rule book. 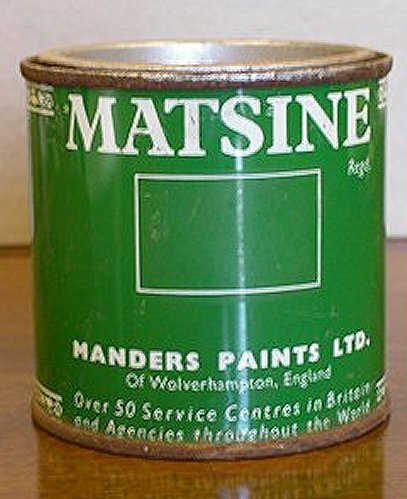 A tin of Matsine, a transparent flat drying colour which could be used as a wood stain, a scumble or a glaze. 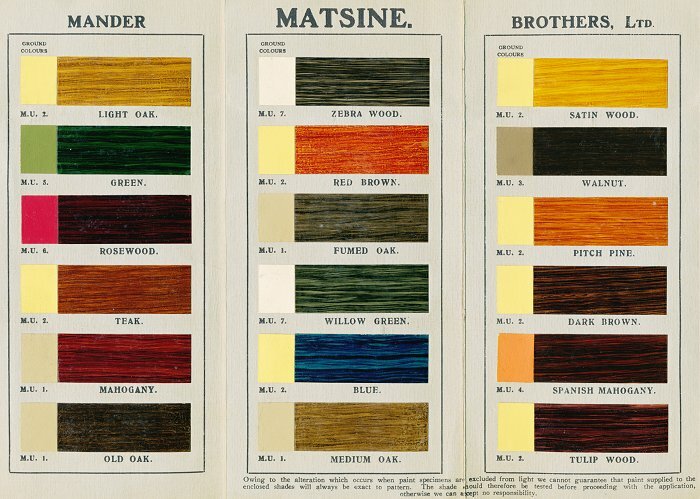 From a Matsine colour card showing its use as a wood stain. 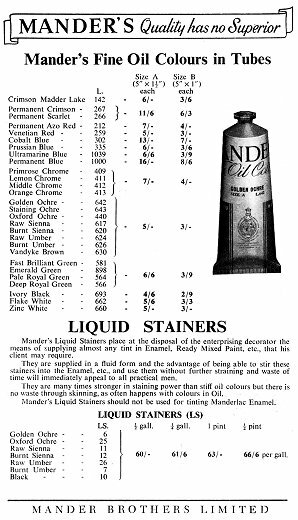 A colour card showing Mander's decorator's colours in oil. 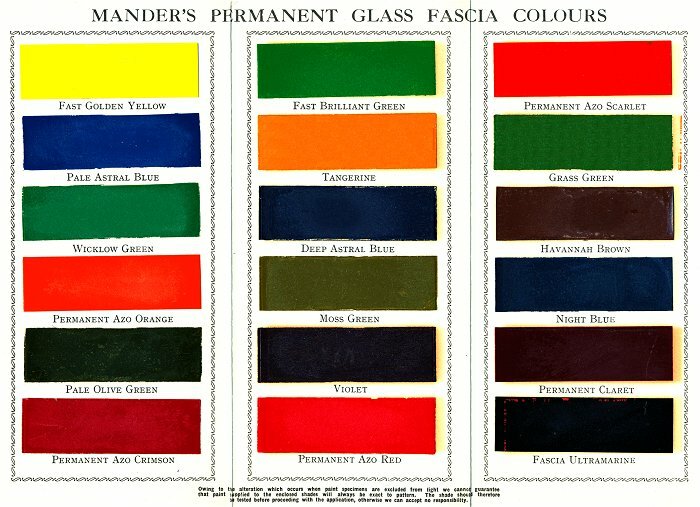 A colour card showing Mander's permanent fascia colours. 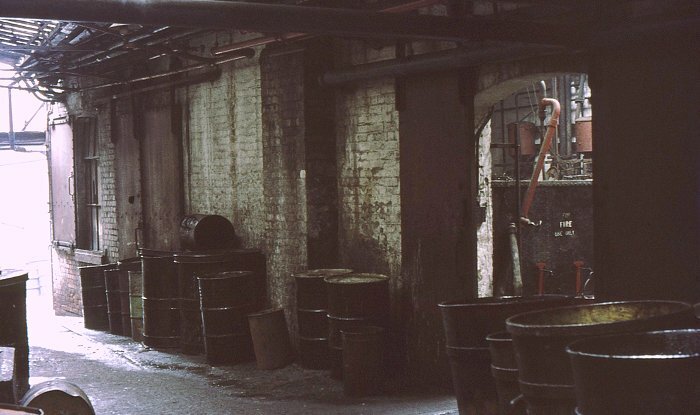 In the 1960s the John Street factory closed, and the site was redeveloped into the Mander Centre, a shopping centre covering 5 acres. The company set up a property division to control the project, in which retail and office properties were leased. 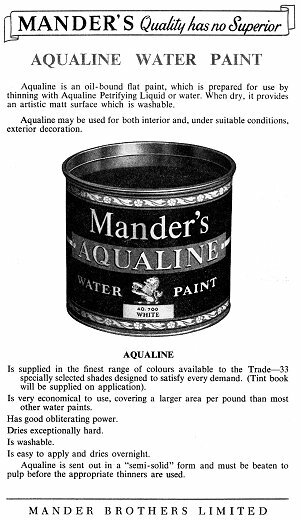 The Mander Centre opened on 6th March 1968 and contained 134 outlets. It was designed by James A. Roberts who designed the Rotunda in Birmingham. The new venture formed a secure base for the company's future activities. 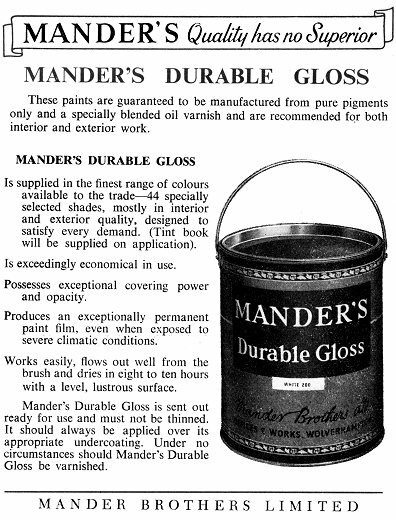 The Mander Centre was, and still is extremely successful.